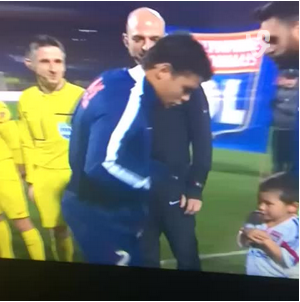 A cute gesture from PSG and Brazilian star Thiago Silva as he offers his jacket to a young freezing Olympique Lyonnais mascot before the Paris side’s clash against the Rhone Valley outfit on 8th February, 2015. Silva wrapped his jacket around the small child, who seemed a bit overwhelmed regarding the whole thing . The game ended in a 1-1 draw.